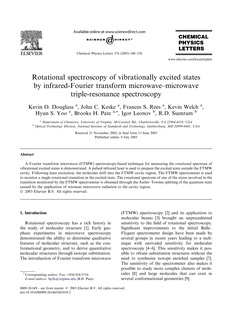 A Fourier transform microwave (FTMW) spectroscopy-based technique for measuring the rotational spectrum of vibrational excited states is demonstrated. A pulsed infrared laser is used to prepare the excited state outside the FTMW cavity. Following laser excitation, the molecules drift into the FTMW cavity region. The FTMW spectrometer is used to monitor a single rotational transition in the excited state. The rotational spectrum of one of the states involved in the transition monitored by the FTMW spectrometer is obtained through the Autler–Townes splitting of the quantum state caused by the application of resonant microwave radiation to the cavity region.